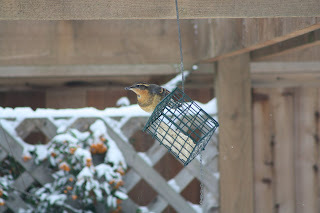 One of the best things about a snowy day is that so many more birds come to feed. 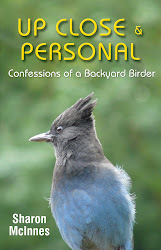 Most mornings, during 'breakfast hour', there are about 30-35 birds at any one time in our back yard. (I know this because I participate in Project FeederWatch.) But this morning when I got up to re-hang the hummingbird feeder for the pair of Anna's in our neighbourhood, I counted close to 100 birds (including juncos, chickadees, towhees, song sparrows, fox sparrows, varied thrush, northern flickers, house finches, and two Anna's hummers) just in our backyard, and the front yard was busy too. That's what happens, of course, if you provide food and fresh water in the cold of winter when natural sources of food and water are so much scarcer. I couldn't resist putting on my boots and getting out there to take a few pictures of today's "snow birds" to share with you. I spent much of the day watching the hilarious shenanigans of the birds as they vied for food - although there was, of course, an endless supply. Just when I thought I had determined who was at the top of the inter-species hierarchy, some brave little juncos attacked the Northern Flicker, completely ruining my current theory. But the Fox Sparrow pretty much always managed to get the juncos to scatter. After several winters of spending too much time refilling pie plates full of water (to prevent them from becoming ice) when temperatures fell well below zero, this year I treated myself to a birdbath heater with a thermostat. Although most birds can get their water needs met by chipping away at ice and drinking snow, this is much more efficient - for them and for me. Because I moved one of our birdbaths onto the back deck in order to plug in the heater, I get a real bird's eye view of all the birds who come for a drink as I sit warm and toasty at our dining room table. I recommend the indulgence. but today, in the snow, they are. Most (although not all) birds will survive the winter without us humans intervening but I'm not so sure about the Anna's hummers. Let's not take a chance! 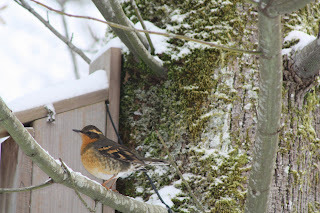 What "snow birds" are you seeing in your back yard? Anything unusual? Birds and Plastic Don't Mix Either! Afterward, as an antidote, you might want to view a few of the short videos of the mother and baby albatrosses now at http://www.midwayjourney.com/. Finally, think about ways to become part of the solution by checking out http://plasticpollutioncoalition.org/learn/common-misconceptions/ . What ideas do you have for reducing your own plastic consumption? Let's share them! Birds and Oil Don't Mix! Then talk to your families, friends, and neighbours about this travesty. If it is not stopped it will be a tragedy - and eventually a disaster for our environment. Birds included. The CBC was started in 1900 by American ornithologist Frank Chapman. That means this year’s count is #111! Today, winter birds in over 2000 locations across North and Central America are counted between December 14 and January 5. This year, in Nanaimo and on Gabriola, count day was December 28. Information gleaned from over a hundred years of Christmas Bird Counts gives scientists invaluable information about how early winter bird populations constantly change in the face of changing climates and for many other reasons. On Gabriola, only the north end of the island (up to an imaginary line that runs approximately between Degnen Bay Road on the north side to Garland on the south side) is included in the count. This area is divided into 12 sections, and each section has a Team Leader that reports the findings for their section to the coordinator of the count for Gabriola Island. 4. Golden-crowned Kinglet: (256) The highest numbers were seen in Area “I” which includes the 707 and Area “G” which includes the Island Trust Fund Nature Reserve. 7. Mallard: (182) Mallards were seen in most areas, even in Area “I”, where we found a pair happily swimming on a very small pond off Barrett Road. That was a nice surprise! 8. Surf Scoters: (111) The majority were seen near Orlebar Point. BUT WHERE WERE YOU HIDING? Sometimes what you don’t see is almost as interesting as what you do. This year CBCers saw no Barred Owls - nor any other kind of owl, including the Snowy that has been seen on the island recently. It's quite possible that the lack of sightings (or "hearings"?) was that no one counted at night. And no Band-tailed Pigeons. On the day of the CBC Band-tailed Pigeons were not seen in Nanaimo either. A big thanks to everyone who participated in this year's Christmas Bird Count and especially to Phyllis for coordinating the count on Gabriola. Happy New Year everyone!